A creative page-turner brimming with articles and activities! Al Ritmo offers authentic topical texts in Spanish on fascinating events, cultures and traditions within Spain and Latin America. 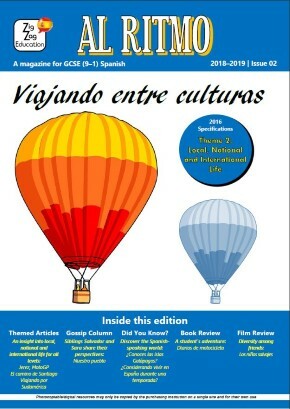 In colour and with illustrations, this termly educational magazine will provide a refreshing step away from traditional learning – inspiring GCSE students to engage fully with the Spanish-speaking world and providing teachers with original, up-to-date resources. Students can read interesting facts in the ‘Did you know?’ articles, delve into the life and trials of brother and sister duo Sara and Samuel in the ‘Gossip column’ peruse the ‘Themed articles’ tailored to three different levels… and much more! Flexible! For use in class, as independent extension work for eager students, as homework, for extra topic revision and cover work. 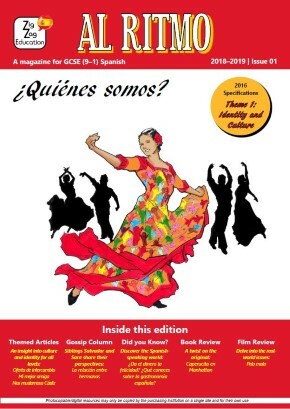 Your subscription will start with the current issue of Al Ritmo. Subscription includes three issues, one magazine copy of each issue. Upgrade your subscription to receive an A4 photocopy master, e-copies and a CD with recordings of key articles by native speakers – students can practise their listening skills and improve their pronunciation.